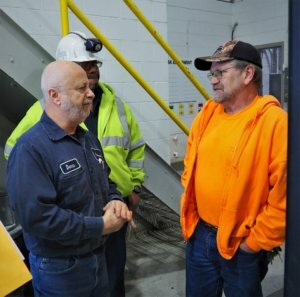 The Members of UMWA Local Union 425 working at Carmeuse Lime and Stone take great pride in their ability to mine the natural resources that help build our Nation’s infrastructure. 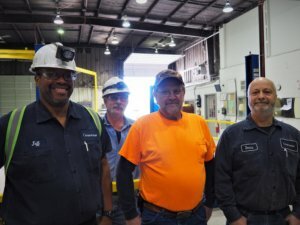 The more than 95 classified employees at the Maysville, KY facility have been members of the UMWA since they first voted to join the Union on April 25, 2008. “Since we voted to join the UMWA, Carmeuse has changed substantially for the better,” said Local Union President Keith Shoemaker. “Having a Union contract makes a huge difference. 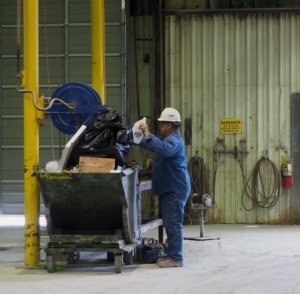 We have greater job security, a grievance procedure and a Health and Safety Committee. The company treats the workers with a lot more respect. We have been through a great deal to get where we are, and we just can’t take it for granted.” Brother Shoemaker began working at Carmeuse right out of high school as a general inside laborer. At the time he didn’t think his mining job would be a long term career. In fact, Keith didn’t think he would last six weeks on the job. 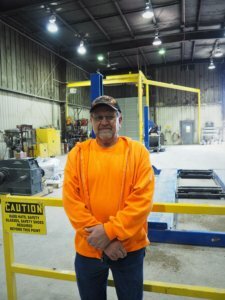 Today, after more than 37 years with the company, he is a heavy equipment operator and doesn’t plan on changing careers anytime soon. The mine and plant produce quicklime and chemical grade limestone, most often used to make steel and for water treatment. They also produce crushed limestone for use in asphalt and ready mix concrete. “The UMWA is blessed with an extremely diversified and dedicated Membership,” stated President Roberts. “The Members of Local Union 425 represent a sector of the metal/nonmetal mining industry that plays such an important role in all our lives. The natural resources they mine and process are used to make steel for construction, aggregate for roads and can even be used to soften the water we use in our homes.